2) Associated with large atria, normal-sized ventricles and variable systolic function. Normal LV dimensions, normal or low fractional shortening %. 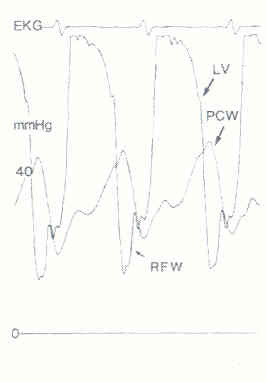 Abrupt cessation of filling creates a jerky, spasmodic wall motion. Therefore, E/A ratio is increased. 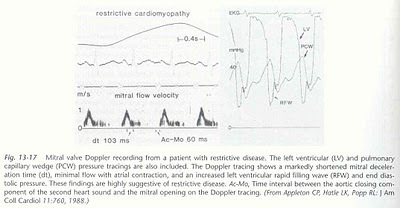 Mechnism of short deceleration time (MV): Rapid equalization of LVEDP and Atrial pressure(corresponds to "Rapid filling wave" in LV trace in cath lab). Further shortening of TV deceleration occurs with inspiration (Increased filling -> septum bows to left -> Decreases LV diastolic function. 2) Increased or prolong flow reversal during atrial contraction (worse during inspiration)...Reflects decreased RV compliance.